A foot attack is when a foot ulcer occurs as a result of small blisters or cuts which go unnoticed as a result of sensory neuropathy. Foot attacks are extremely serious and it is imperative you see a medical professional immediately if you think you are suffering one. You may not experience pain due to damage to the nerves, so it is important to check for visual signs of foot attacks. Warm, red or swollen feet; broken skin and discharge which may be accompanied by a feeling generally unwell are the major symptoms of a foot attack. If you believe you are suffering from a foot attack you should contact your doctor or Foot Protection Service straight away. If they are unavailable and symptoms do not improve after 24 hours you should go to A&E. If treated promptly you will likely be put on a course of antibiotics and dressing will probably be applied to your foot. If left untreated then foot attacks can lead to amputations in extreme cases. sensory neuropathy reduces these sensations in the extremities of the body, most notably the feet and toes, but also the legs and arms. Symptoms of sensory neuropathy can include tingling and numbness in the feet, losing the ability to feel changes of temperature, loss of coordination, burning pains and the loss of ability to feel pain. As a result of the loss of sensation, sufferers of sensory neuropathy may not notice minor injuries to the feet, such as small cuts or burns. Left untreated these small injuries can develop into ulcers and infections, which can necessitate surgery. Foot ulcers due to sensory neuropathy cause more hospital admissions in diabetics than any other complication, but they are preventable. It is essential to receive at least annual foot health checks from your consultant or medical professional. If diagnosed with sensory neuropathy, these checks should be done more frequently. Check your own feet daily; treating any soreness, calluses, redness or minor cuts is much easier than treating a foot ulcer! Feet should be washed daily, make sure the water is not too hot or cold (around 30°C), and dry with a soft towel. Moisturise your feet regularly, take care of your nails and wear good quality socks, avoid socks with holes as these can cause blisters. Avoid using corn removal creams and plasters, and always check with a medical professional before using any new foot care product. Pumice stones can be used to carefully remove small areas of hard skin, but you should seek medical advice if you have excessive areas of hard skin. Foot problems are always going to something people with diabetes need to think about, but with a few sensible precautions they should be avoidable. Always wear comfortable, well-fitting shoes. You may find an orthotic insole useful; these give cushioning and support to your feet, and reduce pressure on at-risk areas of the sole. Never ignore strange pains or tingling in your feet, a quick trip to the doctors is infinitely less scary and inconvenient than a foot ulcer. Most importantly, try to keep blood sugars under control. This can be difficult, but regularly checking your blood sugars, taking your prescribed medication and, if necessary, proper carb counting, is always a good first step. 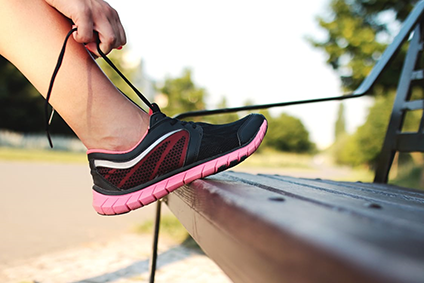 Try to lead an active lifestyle; even just a daily short walk can result in better health. Remember to relax! Getting stressed about diabetes is counterproductive as stress messes up blood sugar levels. These days it’s possible to live a perfectly normal life with diabetes, so don’t worry.